With recent fears about security, and given that these processors are aiming to go to the Enterprise space, AMD had to dedicate some time to explaining how secure the new platform is. AMD has had its Secure Processor in several CPUs at this point: a 32-bit ARM Cortex-A5 acting as a microcontroller that runs a secure OS/kernel with secure off-chip storage for firmware and data – this helps provide cryptographic functionality for secure key generation and key management. This starts with hardware validated boot (TPM), but includes Secure Memory Encryption and Secure Encrypted Virtualization. 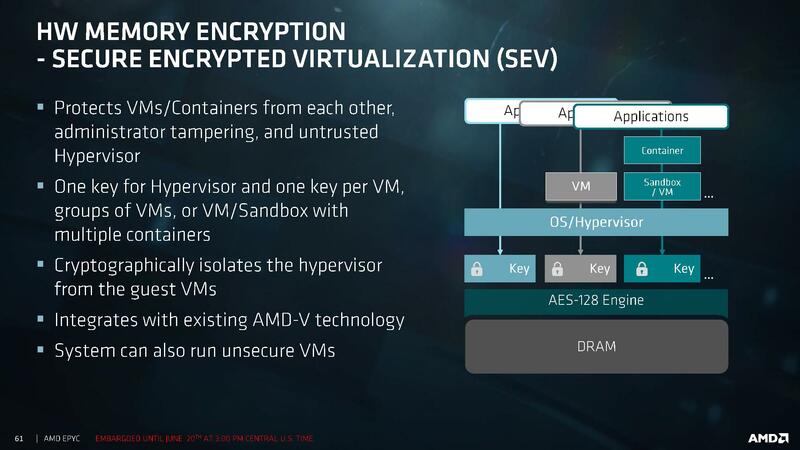 Encryption starts at the DRAM level, with an AES-128 engine directly attached to the MMU. This is designed to protect against physical memory attacks, with each VM and Hypervisor able to generate a separate key for their environment. The OS or Hypervisor can choose which pages to encrypt via page tables, and the DMA engines can provide support for external devices such as network storage and graphics cards to access encrypted pages. Because each VM or container can obtain its own encryption key, this isolates them from each other, protecting against cross-contamination. It also allows unencrypted VMs to run alongside encrypted ones, removing the all-or-nothing scenario. The keys are transparent to the VMs themselves, managed by the protected hypervisor. It all integrates with existing AMD-V technology. Alongside this are direct RAS features in the core, with the L1 data cache using SEC-DED ECC and L2/L3 caches using DEC-TED ECC. The DRAM support involves x4 DRAM device failure correction with addr/cmd parity and write CRC with replay. Data poisoning is handled with reporting and a machine check recovery mode. The Infinity Fabric between dies and between sockets is also link-packet CRC backed with retry. One element that was not discussed is live VM migration across encrypted environments. We fully suspect that an AMD-to-AMD live migration be feasible, although an AMD-to-Intel or Intel-to-AMD will have issues, given that each microarchitecture has unique implementations of certain commands. Believe it or not - for the older guys here the more well known Linus is Linus Torvalds, the creater of Linux (after whom it is named), not a YouTuber. Ooooh, I have Pay Pal and I'd love to earn 1000 Tasmanian Pesos a week for 5 hours a day from the comfort of my own home.